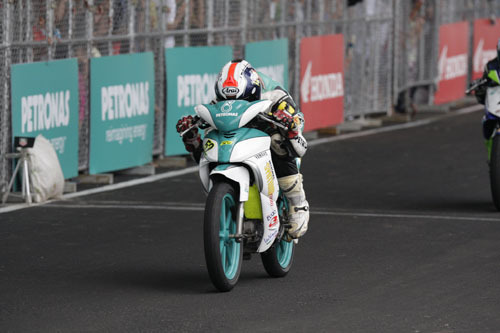 Highly-experienced rider, Mohd Zamri Baba successfully broke his podium drought in this season’s PETRONAS AAM Malaysian Cub Prix Championship at Stadium Sultan Ibrahim, Bandar Diraja Muar, Johor. The PETRONAS Syntium Moto Yamaha Raceline rider put on an impressive pace to match CP130 race winner, Ahmad Fazrul Sham (10’25.313s) and runner-up, Azlan Shah Kamaruzaman (10’26.203s, completing the race with a total time of 10’26.520s. Although pleased to finally land on the podium, Zamri remains uncertain if it will be enough to turn his CP130 campaign around. Zamri felt that he could have finished better at the Stadium Sultan Ibrahim and viewed his third place finishing as a wasted opportunity because the team was finally on top of their game compared to the first five rounds of the season where his best finishing was fifth place in Kangar (Round 3). “The outcome could have been better in Muar. It was possible to finish either first or second as we managed to take pole position and the mechanics did a great job setting up the machine. Unfortunately, a slow start on my part gave Fazrul and Azlan the holeshot to dominate the race. Nevertheless I kept pushing and by the fifth lap I was already behind Azlan but there was very little room to overtake on the new track. Yet I’m still quite happy to finish on the podium,” said the 29 year old. With 49 points in hand, Zamri currently stands in eighth place while Azlan Shah leads the CP130 overall standings with 100 points. Round 6 winner, Fazrul Sham has jumped up several rungs to reach the second overall position with 82 points and Mohd Zaqhwan Zaidi third, 81 points. Meanwhile defending Champion, Shahril Izzuwan Mohd Noor claimed the chequered flag in the CP115 class. The PETRONAS Syntium Moto Yamaha AHM rider rode strong to overtake leader, Mohd Emir Firdaus Hasan in the first lap and maintained a steady ride to the finish line, completing the 12 lap race within 8’34.714s. Emir on the other hand ended his podium drought coming in second with a total time of 8’36.352s after a tight battle with Elly Idzliaikmal Ilias who crashed in the fourth lap. Completing the top three line-up was Ahmad Afif Amran (CKJ Yamaha Racing) with 8’36.521s. A total of 91 points after six rounds of competition so far has given Shahril the lead in the CP115 overall standings. “We had a great close race today and I’m very happy to win here in Muar. I was not too worried fighting my way through the frontrunners although I started from third row because the first turn was very tight and I anticipated a lot of riders would make a mistake there which they did. A lot of them ran wide or too near the curve and I monopolized on this opening. From there I just focused on breaking away from the pack with a consistent pace,” said Shahril. Second overall on the CP115 points chart was Ahmad Abdul Kadir (Apido Yamaha Boon Kui) with 84 points followed by Mohd Amirul Ariff Musa third, 82 points. Lastly, the WIRA category, Mohd Hafiz Nor Azman put on another strong show to chalked his second win for the season. 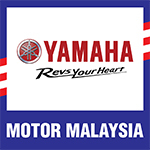 The Mos Track Pro Yamaha Racing timed 7’05.479s to hold off closest rival, Fakhrusy Syakirin Rostam in second place with 7’09.911s followed by Mohd Hafizuddin Azahar third, 7’18.845s. With this win, Hafiz strengthens his lead in the WIRA standings with a total of 119 points while Fakrusy takes second spot with 108 points while Tengku Amirul Haffiruddin (Motul Yamaha YY Pang Racing) moves up the standings from fourth to third with 62 points.